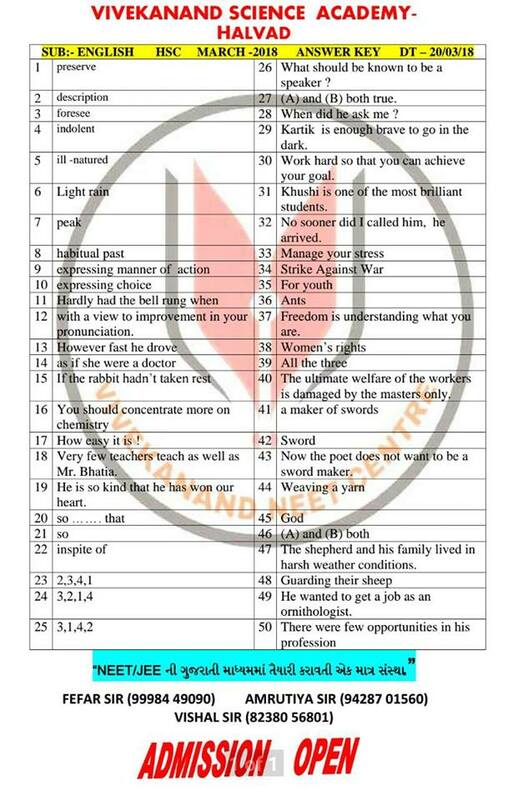 STD.12TH HSC EXAM:-ENGLISH PAPER PART-A MCQ QUESTIONS PAPER SOLUTIONS BY VIVEKANAND SCIENCE ACADEMY. PLEASE NOTE : THIS PAPER SOLUTION FOR PARENTS WHO WANTS TO ASSESSMENT ANSWER OF QUESTION PAPER FOR HIS/HER CHILD,STUDENT PLEASE DON’T USE THIS SOLUTION,BCOS THIS TIME PREPARATION FOR OTHER PAPER, ONCE YOU COMPLETE ENTIRE EXAM THAN DEFINITELY YOU WILL USE THIS PAPER SOLUTION.MUST DOWNLOAD THIS SOLUTION FROM BELOW LINK. Previous articleDhoran 10 Ganit Ni Paper Agharu …Read Newspaper Report.